I happen to be in the Charlottesville, Virginia area last weekend and found a few things of interest to building collectors in anticipation of this weekends’ Souvenir Building Collectors Society’s Convention there. Montpelier, the home of James Madison, Father of the Constitution, architect of the Bill of Rights and fourth president of the United States is nearby. It was here that he read, researched and thought more deeply about our republican form of government than any other Founding Father. Montpelier Estate was formed in 1723 when Ambrose Madison, President James Madison's grandfather, and his brother-in-law, Thomas Chew, were deeded 4,675 acres in the newly opened Piedmont of Virginia. The Madison family owned Montpelier for more than 120 years – from 1723 until 1844 when Dolley Madison sold the property. The visitor’s center on the property has a 3-D map of the estate and grounds. The gift shop offers a ‘flat’ wooden replica of the main house and gold-colored metal ornaments of Madison's Home and the Madison Temple. Also in the areas at the Monticello Visitor’s Center on Route 20 just off Interstate 64 is a basswood model of the Carriage Front Northeast – the “first house” at Monticello based on Jefferson’s own designs and specifications up to 1789. 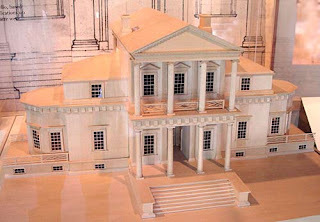 Also called “First Monticello” or “Monticello I,” this was the design of the house from 1770-1796. This structure may have been unfinished when in 1796, Jefferson began an extensive remodel and enlargement which became the Monticello we know today.